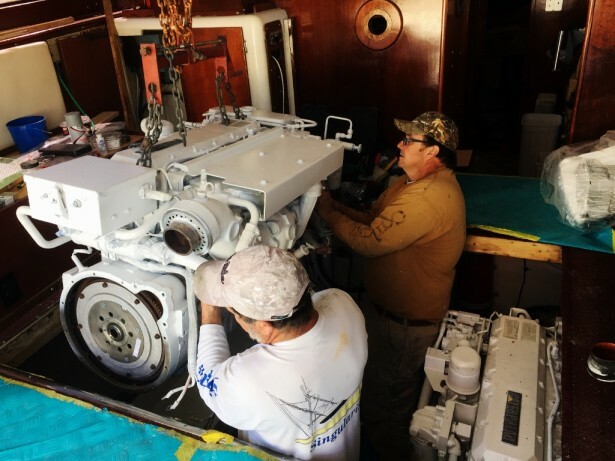 Our Charter Boat Renovation Project for 2016 Is Done – We are now ready to fish! The winter of 2015 through the spring of 2016 was the longest time period I have ever experienced in the boat yard since I bought the boat in 2002. For 3 1/2 months, I had the Distraction Charter boat out of the water and up on blocks where I could get to everything including my engines in a reasonable manner. This year was the year I designated as the one where my engines got re-built and all of my wiring and plumbing got replaced. These projects I am talking about are something our fishing customers ever get to see, but if these things were not done on a routine basis, your fishing charter can end up being delayed or cancelled altogether due to malfunctions. I want to report to you that we are now ready to fish and our boat is ready to go. Some Didn’t Understand Why I Pulled Perfectly Good Engines Out Of My Boat. Well, I come from a different industry where fleet maintenance on over 9,000 trucks and 21,000 trailers was as important as generating revenue. In my past, I learned that providing reliable service was a direct result of having a fleet that was well maintained. 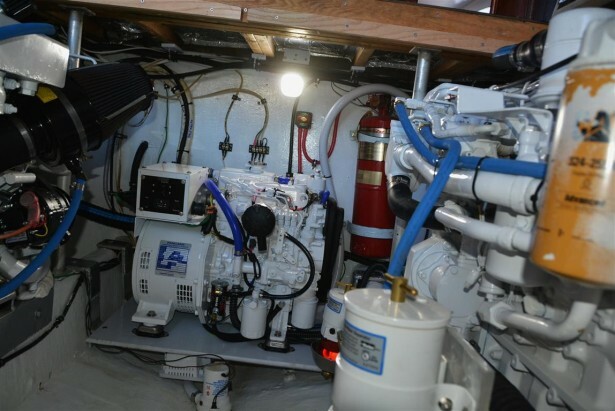 Besides, there is nothing more embarrassing than having your customers on board the boat and your engine won’t start or worse, something in the engine room or electrical department has failed. Being a boat, saltwater takes its toll on equipment and sometimes things don’t work as they should. All I know is, if I do maintenance routinely , I hope my customers never having to see me open the engine room hatch and try and figure out what is going on or why an engine won’t start. Each Caterpillar 3126 marine engine weighs in at 1,700 pounds. 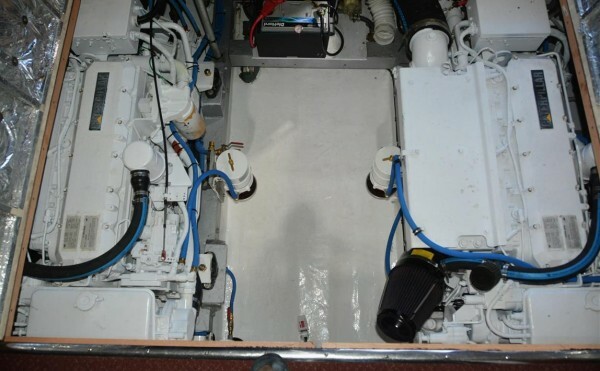 Installing big engines in a small space required a lot of pre-planning and expertise. 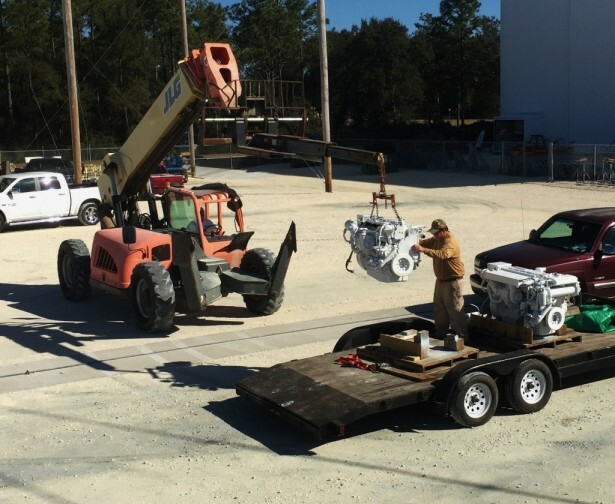 Our engines were re-manufactured in 2016 and are 350 horsepower, 6 cylinders made by Caterpillar. With new paint, hoses and filters, she is ready to give another 13 years of service. 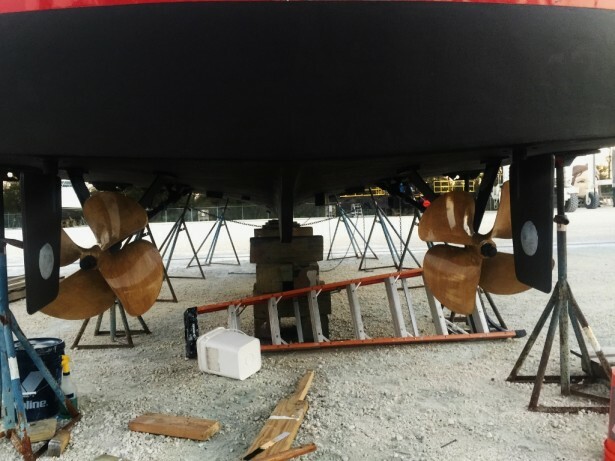 These new Michigan Wheel DQX 24 x 26 nibral propellers give 30% more efficiency and pulling power. 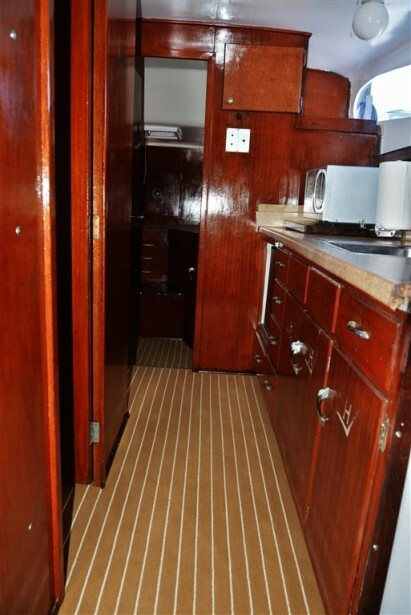 The Galley has new Marine Tuft Teak n Holly Carpet. Our restroom is clean and odor free. 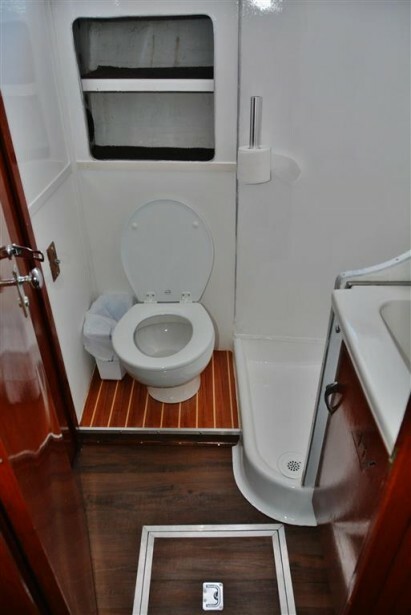 Our toilet (head) is a full size Raritan Brand, Marine Elegance model and is fresh water filled and operated with a simple press button.